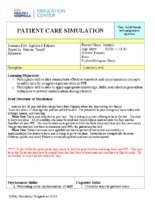 This Agitated Patient Care Simulation has two learning objectives. 1. Participants will be able demonstrate effective teamwork and communication concepts to safely care for an agitated patient while in PPE. 2. Participants will be able to apply appropriate knowledge, skills, and infection prevention techniques to prevent contamination during a breach. NYC Health + Hospitals, “Patient Care Simulation: Case: Adult female with progressive agitation,” NETEC Repository, accessed April 19, 2019, https://repository.netecweb.org/items/show/396.